As a life-long resident of Hanover, I specialize in Hanover, Littlestown, New Oxford, McSherrystown, Spring Grove and nearby communities. I have assisted many folks like yourselves to relocate to my hometown. You can be assured of my professional dedication and conscientious work ethic. On 2 separate occasions I have received national recognition as 1 of 10 agents from 10,000 agents in the ERA franchise nominated for ERA’s “Customer Satisfaction Award”. A survey is sent to Sellers and Buyers using ERA companies when purchasing or selling real estate. As a result of those surveys and the satisfied responses from my clients, I was honored as a finalist. I have been a full-time agent since 1976 and my main objective has always been to serve the needs of my clients in a timely fashion using all my skills and experience to their best interest. And we even had some fun at the same time! If you are selling your house, I will use innovative marketing techniques to expose your house in the marketplace and attract potential buyers. Whether you are buying or selling, this is probably one of the most important decisions you will ever make and I will assist you every step of the way to ensure a smooth transaction. 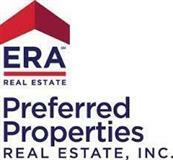 My office, ERA Preferred Properties Real Estate, Inc., also specializes in taking care of our clients. We have received ERA’s “First in Customer Satisfaction Award” on 3 separate occasions. Considering there are 2400 companies nationally, we are proud to have our professionalism recognized. I look forward to your becoming another of our success stories. I am prepared to go to work for you. I am only a call or email away. I am a grandmother of 4. They call me Grammy. They are the joy of my life. When not doing real estate, I enjoy my flower gardens, picking my homegrown tomatoes in the summer and walking my best friends, Buddy and Pippi. I got Buddy as a puppy. He is a 6 yr old long-haired dachshund. I rescued Pippi in 2017. We take long walks and they help me relax after a long day of helping my clients buy and sell houses. My slogan is “Your dreams are my business” and I take that very seriously. You can always count on me.